Thanks to all who participated, visited and supported! Quilt Walk & Car Show! On Sunday August 19th, 2018, thousands of visitors and residents will flood the streets of The Historic Ladner Village to take in hundreds of classic cars and colourful quilts. This year’s show promises to deliver all your favourites: Great food at the various food trucks set up throughout town, vendors that showcase anything retro, antique and collectable, car part suppliers, a Pin Up Pageant and last but not least, “The Lounge Hounds” will be partnering with Ben Klein as “Elvis” to keep your grooving throughout the day. We wouldn’t be able to hold this amazing event without the support of our wonderful Sponsors! Thank you in advance for your support. For information regarding sponsorship for the LBA’s biggest event of the year please click here. With over 18 different Vehicle Classes you can imagine we'll have hundreds of cars in attendance for you to see. Open to all Classic Cars, Trucks & Motorcycles. Pre-registration is not required but the first 150 cars will receive a gift bag so plan your day now. The 2nd largest car show in BC, this show sprawls throughout historic Ladner Village, giving the spectators a chance to enjoy numerous activities throughout town including restaurants, shopping, retro street vendors, Food trucks, live music and a Pin Up Pageant. If that’s not enough Ladner also is home to numerous local farms on Westham Island, fruit wineries and so much more. The Quilt Walk and Car Show is a great place to walk around and view over 150 quilts! All the store front windows of Historic Ladner Village are filled with beautifully colourful quilts. Stroll along the sidewalks and check out every window for a different quilt on display. The quilts have been lovingly made by local B.C. quilters and are proudly displayed throughout the town. With over 150 quilt to see, the options are endless from those made by young children to those original ideas of local designers and everything in between. As you stroll the streets of Ladner, pick up a ballot and VOTE for your favourite in one of three categories - Traditional, Modern and Youth. Anyone can enter a quilt they have made and there is no limit to the number of quilts you can choose to enter. Registration forms are available by clicking the link below. The cost to register a quilt is just $3 and that money all goes to the Delta Hospital Foundation in support of our local hospital. These Rockin' Bands Start Up At 10am! The Lounge Hounds have been rockin' the the Fraser Valley and Lower Mainland since 2008. Singer and guitarist Keith Marr, bassist Evan Duncan and drummer Tyson Finley came together in and just after high school with their shared love of original rock & roll, R&B and 60s pop music. A talented multi-instrumentalist, frontman Keith Marr cut his musical teeth in a household headed by its own band leader. His father founded The Hornets, an R&B pop act, in the U.K. longer than three decades ago. Evan Duncan swings the deep grooves on both stand-up and conventional bass. Tyson Finley locks it down with steady driving backbeats sprinkled with big-band jazz styling on drums. Geoff Eyre subs in on drumming. Both rhythm section members add backup vocals to fill out the harmony and the sound on stage. Heavily influenced by the pioneering of artists such as Carl Perkins, Johnny Cash, Buddy Holly and Elvis Presley, The Lounge Hounds bring a fresh sensibility to Rockabilly. They deliver a solid punch of lively hooks, high-octane rhythms and finely executed melodies to a new generation of roots rock fans. Benjamin "Lee" Klein was born on January 3, 1981, in the same week as Elvis, only 46 years later. Growing up as the only child of musical parents, he has been singing, dancing and acting all of his life. Through the years, he also learned to play drums, bass guitar, piano and acoustic guitar. In 2002, he bought a '50's Elvis CD for his Dad, Randy, who was an Elvis tribute artist before Ben was born. Then realizing his own resemblance to the young Elvis, he borrowed the CD, found movies and videos, and decided to listen, watch, study and practice. Ben has the looks, the voice, the moves and more! He sincerely feels that if Elvis could say one thing to him it would be to perform his music, especially Gospel, with as much passion as he can. His desire is to do just that, while being as authentic as possible, and honoring God. 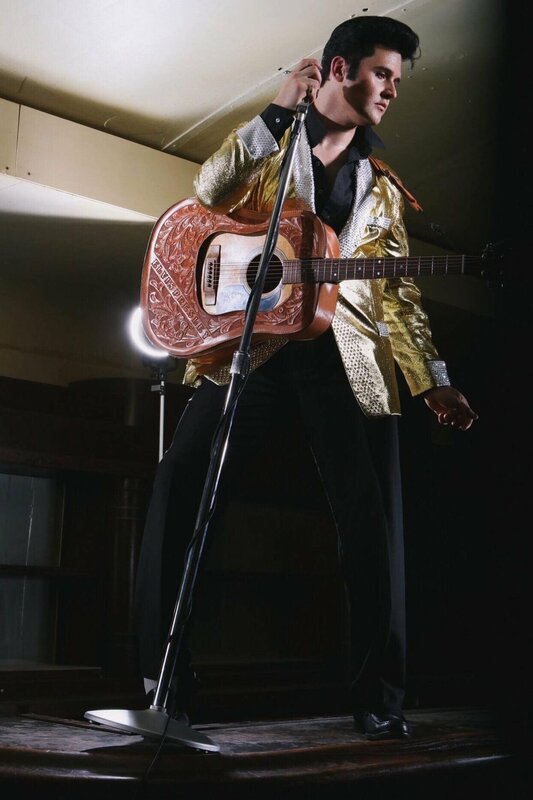 In 2007, Ben became a member of the elite E.P.E top Ten Ultimate Elvis Tribute Artists in the World. Welcome to the 2018 Quilt Walk & Car Show Pin-Up Pageant page! This year's pageant will be presented by Billie’s Barbershop and Bobby Pinz Beauty Parlour and hosted by Dixie Delight and Veronica Belle. Our goal is to have a fun pageant for everyone involved. This year the pageant will take place on Sunday August the 19th. The pageant will be open to the FIRST 10 registered ladies, ages 18 and over. Registration will open on May 25th, 2018 at 9:00am. You may download the entry form along with the required Model Release. CSN Ladner Auto Body Ltd.